We are excited to announce that applications for the SOAS Advocacy Society's first ever mooting competition are now open! 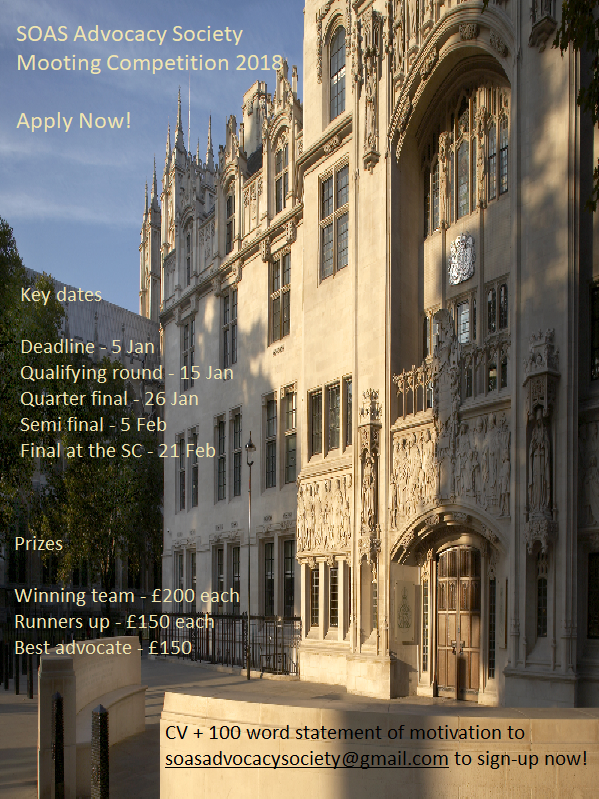 The competition is sponsored by the Incorporated Council of Law Reporting and the final will be held at the Supreme Court as judged by Lord Carnwath. Applications are open to law students at any stage of their studies at SOAS. You can sign up either through our Registration Form or via an email to soasadvocacysociety@gmail.com with a 100-word motivational statement and your CV. We are extending the application deadline to 7 PM on Monday 15th January 2018. Match-ups, team allocation and the mooting problem will be released by 12 PM on Tuesday 16th January. The competition is open to both undergraduate and graduate students enrolled in the school of law. Applications can be made either through our Registration Form or via an email to soasadvocacysociety@gmail.com with a 100-word motivational statement and your CV. The three attachments below include an invitation letter detailing the basics of what the competition offers, a competition handbook detailing procedural intricacies, and a flyer for the graphically minded. This is a unique opportunity given the exposure offered and we look forward to seeing you make the most of it. Please feel free to email us with any queries you may have. 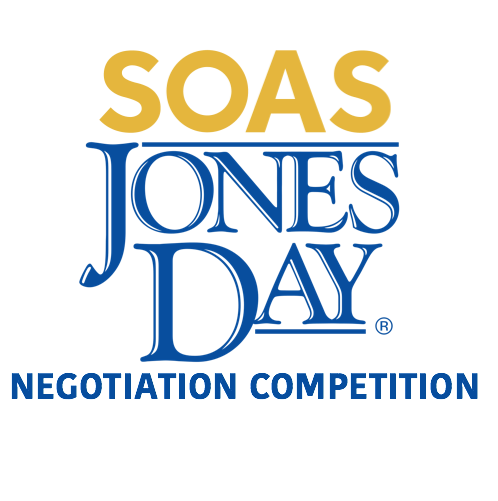 We are excited to announce the first SOAS – Jones Day Negotiation Competition! The SOAS – Jones Day Negotiation Competition is a simulation of real-life legal negotiations based on a dialogue or discussion between two sets of partners, acting as solicitors on behalf of clients, in an attempt to reach an agreement or solve a problem. By the end of the competition, you will have gained valuable experience in negotiation and dispute resolution. This is an excellent opportunity to acquire, develop, and practice negotiation and persuasion skills in a team environment. Participating in the SOAS – Jones Day Negotiation Competition will be an excellent way to showcase your collaborative skills, your ability to think analytically and excel under pressure to your future employers. The competition is open to both Law and non-Law students, and there is no previous experience required as training will be provided. Please find further details about the competition attached. In order to register, please complete this form. The deadline is on 10th January 2018 but places are limited and we advise you to register as soon as possible. Should you have any questions, please contact Ancuta on 640132@soas.ac.uk. We look forward to receiving your registration forms! Global Food Fair - Thank You! 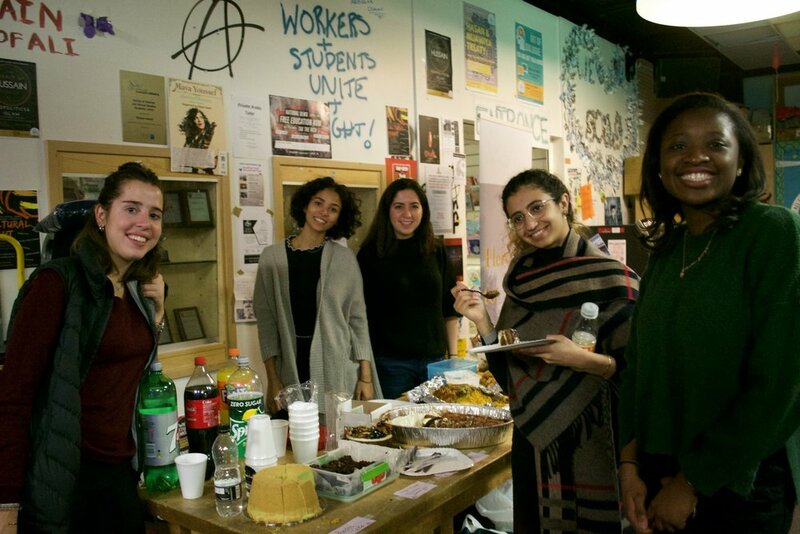 A special thank you to those who were able to come by the JCR to support us at the Global Food Fair last week! Applications will be reviewed on a rolling basis so those interested in applying are encouraged to apply as soon as possible. Places will be confirmed in late December 2017. Alongside non-City law firms, inspirational speakers and practising lawyers, 20 leading City law firms have signed up to the scheme to provide mentoring, work experience and support with training sessions. 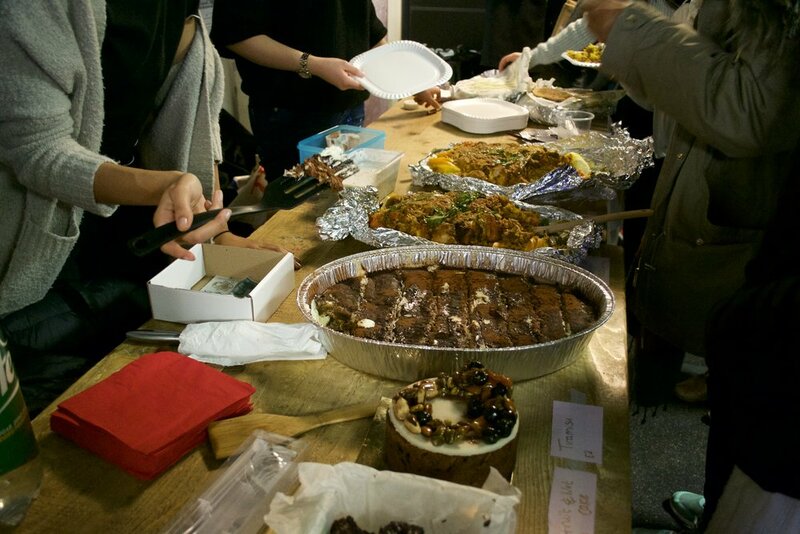 You'll find a wide variety of foods to enjoy including Manakeesh, Biryani, Efo Riro, Pandan Cake, Tiramisu, and more! Come support the Law Society and fill up your plate (and tummy) as much as you can for £5 and refills for £2 (cash)! Grab a free plate of food if you bring a dish to share! We are raising money to support the SOAS Law Society in holding more events this year to cater to your diverse interests! REDRESS is a human rights charity based in London that works internationally to combat torture by seeking justice and reparation for torture survivors. Through advocacy, litigation and capacity-building REDRESS works to ensure that perpetrators of torture are punished and the rights of victims of torture to justice and reparation are enforced. REDRESS offers legal internships to excellent law graduates and LLM students with a strong background in international human rights work. REDRESS has four regular intakes per year however, in exceptional circumstances, we can be flexible with regards to the start and finish date. Our legal internships will suit candidates who are looking to expand their CV with an interest in developing a career in the Third Sector or human rights field. Placements can be full time or part-time. All placements are based at our London offices (87 Vauxhall Walk, SE11 5HJ) and the successful candidates will work with REDRESS program staff. Lunch and travel expenses are covered up to £10 per day and a minimum commitment of three months is required. In light of the living costs in London, prospective interns are strongly encouraged to seek external funding for the internship through their university or other institutions. Legal interns will work with REDRESS staff on a number of assignments. These include independent research on torture cases, factual and/or legal research for reports and submissions before domestic and regional courts, the International Criminal Court and UN treaty body mechanisms. The role may also require some administrative work supporting REDRESS staff. The SOAS Law Society has prepared a document containing details of most of the Vacation Scheme deadlines. Please note that there are deadlines coming up within the next month. We wish you the best of luck with your applications! 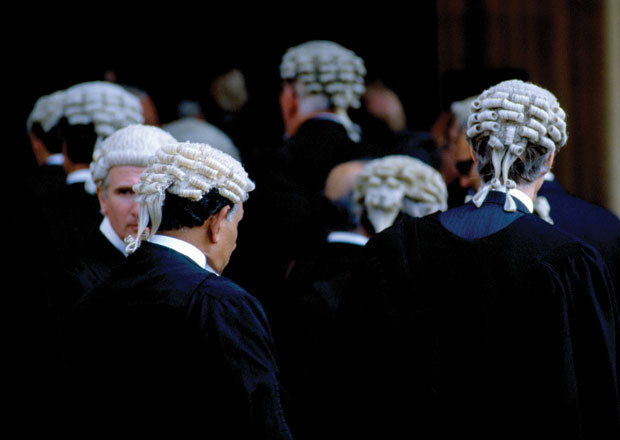 Mini-pupillages are short periods of work experience spent shadowing a barrister, usually spanning three to five days. We encourage all law students to undertake mini-pupillages at some point in their academic career, being the key gateway to acquiring a pupillage as well as a way to gain a practical insight into the operation of law in court. We are pleased to announce that the Moot problem 2018 has now been released. Please read the rules along with the problem and submit your skeleton arguments to Elly-Mae Gadsby no later than midday January 17 2018. This needs to be submitted in Word format along with an entry form. For more details please see the website. All competitors will be notified of the selection outcome during the week commencing 29 January 2018. The finals day will be held again at Kings College London on February 23 2018 so do bear this in mind if you decide to enter. The Institute continues to celebrate its 70th anniversary with a diverse series of events that examine the Institute's contribution to legal scholarship, showcase its research activities in areas of major current concern and highlight future developments. This year's London Hamlyn Lecture is being given by Professor Andrew Burrows, Professor of the Law of England, University of Oxford. How might we improve the quality of our statutes? In the third and final Hamlyn Lecture, and drawing on his experience of having been a Law Commissioner for England and Wales, a number of different avenues are explored. These include the style of statutory drafting, the role of Parliamentary Counsel, pre and post-legislative scrutiny, and the work of the Law Commission in respect of consolidation and statute law repeals. Hamlyn Lecture: How might one improve the quality of our legislation? APPLICATIONS FOR THE SUTTON TRUST’S PATHWAYS TO LAW PLUS PROGRAMME IS NOW OPEN! A LINK TO THE APPLICATION FORM IS HERE. MORE INFORMATION ON THE PROGRAMME IS AVAILABLE ON OUR WEBSITE. It doesn't matter whether or not you were previously a participant on our Pathways to Law programme, or which university you are attending. If you meet the criteria above, you are welcome to apply. You can also feel free to pass this email on to friends and colleagues who meet the criteria. APPLICATIONS CLOSE ON THURSDAY DECEMBER 21ST, AT 5PM, SO DON'T DELAY! YOU CAN APPLY TO THE PROGRAMME HERE. 1. NILS International are holding an event in New Delhi between the 15th and 23rd December based on International Dispute Settlement. You can find out more at this link: http://ow.ly/6dna30fKYm2 - anybody who is interested needs to email office@nilsuk.org expressing their interest as soon as possible! 2. NILS is now accepting your submissions for their law journal! Send your submissions to ambassadorcoordinator@nilsuk.org with your name and university. More details are on the picture attached below. 3. NILS UK is excited to announce the launching of our first competition of the year based on the interesting subject area of Refugee Law! The top three entries will be reviewed by Sir Nicholas Blake QC of Matrix Chambers (a specialist in the area of immigration and asylum and also a previous first President of the Immigration and Asylum Chamber of the United Kingdom Upper Tribunal. He will be selecting the best one, whom will receive an amazing prize - which is yet to be revealed. Look at PDF attached for more details. The SOAS Law Society has prepared a document containing details of most if not all training contracts (2020 start date), including information about deadlines, application processes, academic requirements etc. Having prepared a similar document detailing the summer deadlines, we received positive feedback and decided to produce an updated version for this year's applicants. We hope this will provide an accessible, convenient, and efficient medium through which you can decide which law firms to apply to and proceed with the applications accordingly. The legal department at Study Group, a multinational education management company is looking for a part time/ full time intern at the London Corporate Office. The intern would be required to assist the General Counsel and legal team in multiple aspects of the business, including but not limited to commercial contracts, tax, compliance, HR and other general legal matters. To be eligible, you must be in your final year of your undergraduate law degree, or enrolled in a postgraduate law degree. This is a paid internship opportunity, with flexible hours and other employment benefits, and which is available immediately. For more information and to submit your CV, please contact Shannon Lim at 634517@soas.ac.uk. The BPTC at BPP are running an Advocate of the Year competition. They will be offering a very ‘real world’ experience as a junior barrister doing short trials. There will be a day of civil and a day of crime with actors and ex-convicts to play the clients, and over the weekend of the competition those taking part will play different roles in the trial, and develop an aggregate score. The top prize is £5000 off the BPTC if the student chooses to study the BPTC at BPP. References and other prizes are also available. The event will be on the weekend of the 11th and 12th November. We’re very pleased to announce that the 2018 edition of The Training Contract & Pupillage Handbook is out now! The essential guide to becoming a lawyer, it is packed with details of over 1,000 firms and chambers looking to recruit trainees and pupils, as well as offering advice and information on application and interview technique, alternative careers, work experience and more. The guide is available at the SOAS Careers Service on the LG floor of Paul Webley Wing, SOAS. You can find out more about The Training Contract & Pupillage Handbook at http://www.tcph.co.uk/. This November we are running our flagship event, Step into Law. This event is ideal for students who would like to pursue a career in the legal sector. Step into Law provides attendees with valuable insight into the legal market, what to expect from future assessment centres and tips on how to improve employability prospects. Following the workshop sessions, students will be given the opportunity to put their questions about the legal profession to our select law firm representatives on the Q&A panel. Following the panel, students will be able to network with panel members and Law firm representatives. The event will take place on Wednesday 15th November 2017, kicking off at 12pm and finishing at 6pm. More information can be found on the attached event agenda, although please be aware that certain information may be subject to change. This a great event for potential students and law firms to engage with one another and for students to get a real insight into a career in the legal industry, as well as the opportunity to network with potential future employers. 2- Respond to this email confirming your: Full Name, University, Email Address, and Phone Number. The SOAS Law Society is holding an exclusive dinner with Travers Smith LLP, a leading corporate, financial and commercial law firm. A select few of you will be able to network with its trainees and learn more about the firm in preparation for Vacation Schemes and Training Contracts applications. The dinner will consist of a 3 course meal and will take place at The Refinery in New Street Square on the 22nd November. More information will be released in the weeks leading up to the event. To apply, please find attached the TS Dinner Application with further details. Please note that the first deadline is 1st November. We look forward to receiving and reviewing your applications! Please direct any queries you may have to Sonia at lawsociety@soas.ac.uk. Please be assured that in the interest of the Law Society, we intend to accept those candidates who have shown the most interest in Travers Smith. As such, we will select students accordingly with this criteria in mind. Additionally, your application will be reviewed by members of the Law Society who are not applying to the dinner. Only members of the Law Society who will be reviewing your application will have access to your application, and these same members will not be applying for the opportunity themselves. What the reviewing panel will be focusing on is not the details of your grades, rather, the commitment and interest you have shown in the firm and how you hope to use this dinner as an opportunity to invest further into your prospective career with the firm. If you are put off applying by the requisites of the process (CV and Cover Letter), please note that it allows us to select you based on your demonstrated interest in the firm rather than on factors such as your academic achievement. Additionally, doing your research on the firm will help you engage far more in conversation during the dinner. This dinner is a great opportunity to showcase your interest in Travers Smith when it comes to applying for Vacation Schemes or Training Contracts with them. Don't miss it! We make the candidate better, not the process easier. We help brilliant people fulfil their promise through our one on one career guidance and multi award-winning longitudinal development programmes. With Rare, you choose which applications to make to which clients. You always apply in the same way as any other candidate: the same application form, sit the same numerical and verbal tests, and do the same interviews and assessment centres. There are no “fast tracks” and no back doors – you get the job on merit. Rare’s standards are high; we’re elite – we look for outstanding people – but not elitist - we have people from over 100 universities on our books. We have no minimum grade requirements – we look at every application to Rare in its full social, educational and personal context. Apply online. We’ll assess your application and if we think we can help then we’ll invite you to join Rare. We’ll call you to arrange an initial meeting where we can examine some career possibilities. We’ll help you make applications. We’ll give you completely free, one-to-one personal development sessions, with experts including a qualified Executive Coach, in everything from numeracy tests to CVs and application forms; from interviews to group tasks and assessment centres. On average, candidates rate the support they get from Rare at 4.82 out of 5 on a scale where 3 is satisfactory, 4 is good, and 5 is excellent. You’ll receive regular updates with early notice on exclusive Rare client events.